The south jetty at the mouth of the Nehalem river is a fun place to dive that is a little off the beaten track for many divers. The walk to the entrance dissuades many people from attempting this dive but it is well worth the hike if you want to try out a new site. Crabbing and spearfishing are both usually pretty good along the outer part of the jetty. On the inner part of the jetty, it is possible to drift dive way up into the Nehalem river system. The south jetty as seen from Nedonna Beach. The things people come here for are spearfishing and crabbing, and drift diving. During crabbing season, the deep water along the south jetty is packed with boats that people rent from the marinas up the Nehalem River. Sport fishing is a little less common than crabbing but is just as good for those in boats or sitting on the jetty. Underwater there are ample opportunities to catch your limit of just about everything that the law allows you to take while diving. For the more adventurous, you can drift dive from the entrance on the jetty all the way back up into the Nehalem River. The first marina up the river is where you want to shoot to exit unless you want to spend several hours lazily drifting along upstream with the incoming tide. The little town of Nedonna Beach is the closest to the dive site. Further north is the town of Nehalem and several other small settlements. To the south, the bigger towns of Garibaldi and Tillamook await. Smaller villages and towns are also just south of the dive site. From US101 turn onto Beach Street (follow signs for Nedonna Beach). Beach Street will turn to the right (north). Follow it all the way to the end of the road were Section Line Street intersects. There is a public parking area here. The first marina upriver from the south jetty on the Nehalem River is just off US101 and is well-signed. The last time we were here, the parking was free and public at Nedonna Beach. On busy beach days, you might have trouble finding a place to park. Be sure to check the signs when you get to the parking area to make sure it’s still free. The parking at the marina upriver from the jetty may be free but you need to talk with the marina before you park. You also need to talk with the marina to make sure they’re okay with you using it as an exit point. The south jetty at Nehalem is a good place to dive a little off the beaten path and there are some great drift diving opportunities if you are here off-tide. The primary dive site runs east-west along the jetty structure. Toward the jetty tip, conditions get rougher. If the weather is bad, stay on the inner part of the primary dive site. If conditions are good, you can dive around the tip of the jetty and a little inward toward the beach. You could even do a surf exit if you really wanted to. However, water gets shallow fast on the south side of the jetty. The drift dive part of the site follows the Nehalem River up into the Nehalem Bay. We start our dives a few hours before high tide so there is sufficient water still to come into the bay to propel us upstream. You will still have to do some swimming. It’s the best to do this when there is a large exchange between low and high tides to increase the speed at which you go upriver and decrease the need for swimming. The primary site entrance/exit and the drift dive entrance are along the jetty. Be sure to scout out where you want to enter based on local conditions. Where the beach grass and jetty intersect is a good place to start looking. 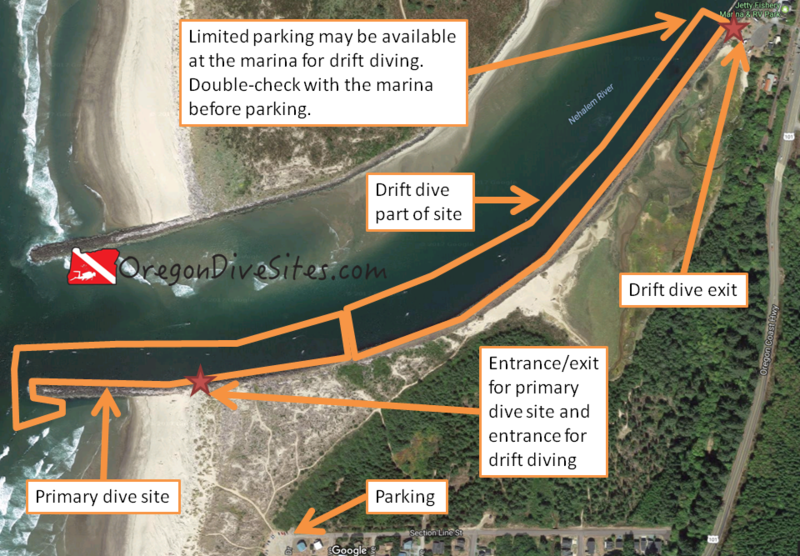 If you’re drift diving, the exit is up at the first marina as you go up the Nehalem River. Be sure to plan your dive well before you try a drift dive here because it is easy to either under or over shoot your exit. You don’t want to be floating along the surface for an hour waiting to exit or end up in the town of Nehalem and have to hitch hike back. This is usually done as a shore dive although if you have a boat to put in at one of the many private marinas or public boat ramps, you can do this site from a boat. If you are doing a drift dive, a support boat can be pretty useful in case you want to exit the water earlier than the first marina. Out on the jetty tip, conditions are often rough. Surf, surge, current, waves, and other nastiness can be expected most of the time. As you go further in the Nehalem River, conditions steadily improve until all you are really concerned about is boat wakes and fishing line. Visibility can vary wildly at this site. If you do this site on a calm day in good conditions, you can get 20 feet of viz on the jetty. If a bunch of silt and sediment has been pumping down the river lately, you can end up with very low visibility. Out on the end of the jetty, expect Pacific Ocean temperatures (45-55F depending on the time of year). Inland, the river starts to influence conditions more. In the summer you might see 60F and in the winter maybe 40F depending on upriver snow melt. This site is accessible any time of the year due to how large it is. Plan what part of the site you dive based on local conditions. Along the outer jetty, you will find 30 feet of water. As you go upriver on the Nehalem, expect 20-25 feet of water depending on how high of a tide you’re riding. If you are staying in the primary dive site, open water divers with experience diving Oregon jetties can do the dive. As you go toward the jetty tip in rougher conditions, you will want advanced training and experience in those conditions. If you are doing a drift dive, you should have a drift diver specialty and experience with drift diving on a river system. We rate this as an intermediate dive although the drift dive can get a little more tricky and the jetty tip can be very challenging. If you stay in the primary dive site though, we think this is an intermediate-level dive. You’re in for a 1000+ foot walk to the jetty from the parking area in Nedonna Beach. A cart capable of travel over the sand and some friends who will watch your stuff while you’re diving are both a good idea. If you do the drift dive, you will either need two cars, a friend to shuttle your car, or be willing to hitch hike to get back to your car. There may be limited taxi service in the area but we suspect they won’t take kindly to wet SCUBA gear in their van. No surface swim is needed on the primary dive site. The drift dive could end up with a very lengthy surface swim if conditions are not good for doing a drift dive. There aren’t really any exits between Nedonna Beach and the marina. The distance between the drift dive entrance and drift dive exit is about 3500 feet. Be sure to plan accordingly. If you’re diving the primary site, do it at high tide. If you’re doing the drift dive, do it only when conditions are right (big tidal exchange) and start your dive an hour or two before high tide so that you’re riding the tide up the river. We don’t recommend trying to do the drift dive in reverse because you could easily overshoot your exit on the jetty and end up getting sucked out to sea which would be unpleasant indeed. Be sure to talk to the people at the marina before doing a drift dive both about the parking situation and to double-check that they will allow SCUBA divers to exit there. You might be able to talk them into transporting you and your gear back to Nedonna Beach in one of their pickups if it’s a slow day. It’s a VERY good idea to fly a dive flag both at the primary and the drift dive portions of this site. There is a surprising amount of small boat traffic along the Nehalem River and jetty. A good dive knife is also a good idea in case you encounter fishing line and get tangled. There used to be a place you could get air fills at the Port of Garibaldi although we can’t confirm if it is still in operation. Otherwise, Astoria has a full service SCUBA shop. In Depoe Bay there is an air fill station that is by appointment only. After that, you’re looking at going inland to Portland or Salem for an air fill or gear service. It’s a good idea to be self-sufficient if you’re diving out on this section of the Oregon coast. There is a lot of good food up and down the coast in this area. You are spoiled for choices here. There are a lot of local campgrounds, vacation house rentals, and hotels in the area. We haven’t tried any of the hotels or vacation house rentals so please let us know if you have a favorite that is SCUBA-friendly.